2014 Panini World Cup Soccer Stickers bring a simple, old-school approach one of the world's biggest competitions. There are sporting events and then there's the World Cup. Outside of, maybe, the Olympics, no other tournament or event approaches its worldwide popularity. And as big as sports cards might be with North American collectors, it pales in comparison to those who collect stickers. The 2014 Panini World Cup Soccer set has well over 600 stickers. In addition to basic stickers of participants, there are 32 foil stickers and 16 holo foil stickers. The collection can be housed in a 72-page full-color album. 2014 Panini World Cup Soccers Stickers boxes come with 50 packs, each with seven stickers. There are also combo boxes that have 100 packs of stickers and 20 albums. This set is a follow-up to the 2013 Panini Road to the World Cup stickers release. Sticker packs carry a $1 suggested price while albums are $2. 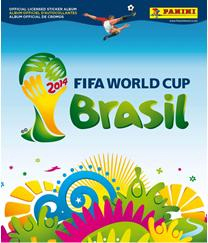 Fifa World Cup Brasil 2014 Sticker Packs Panini Official Packs - FREE SHIPPING! Gracias por publicar la lista completa!! Incre�blemente, en el �lbum no aparecen los nombres de los jugadores. Saludos desde Argentina.